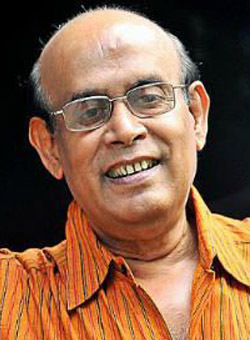 Buddhadeb Dasgupta (born 1944) is a poet and prominent contemporary Indian filmmaker, most known for films like Bagh Bahadur , Tahader Katha , Charachar and Uttara . Five of his films have won the National Film Award for Best Feature Film , Bagh Bahadur (1989), Charachar (1993), Lal Darja (1997), Mondo Meyer Upakhyan (2002) and Kaalpurush (2008), while Dooratwa (1978) and Tahader Katha (1993) have won the National Film Award for Best Feature Film in Bengali . As a director, he has won National Film Award for Best Direction twice, for Uttara (2000) and Swapner Din (2005). Over the years he has published several works of poetry including Govir Araley , Coffin Kimba Suitcase , Himjog , Chhaata Kahini , Roboter Gaan , Sreshtha Kabita , and Bhomboler Ascharya Kahini O Ananya Kabita . Buddhadeb Dasgupta was born in 1944 in Anara near Puruliya in Southern West Bengal, and was third of nine siblings. His father Tarkanta Dasgupta was a doctor with the Indian Railway, thus he spent early part of childhood traveling. It was only at the age of twelve that he was sent to Calcutta to study at Dinabandhu School, Howrah. Post-independence his father was transferred first to Kharagpur in West Midnapore district and to Manendragarh (now in Chhattisgarh). He studied economics at the prestigious Scottish Church College and at the University of Calcutta. Buddhadeb started his career as an economics teacher, at the Shyamsundar College of the University of Burdwan followed by City College, Calcutta. In 1976, when disenchanted by the gap he perceived between the economic theory he taught and the socio-political reality, he took to film making. Meanwhile his membership with the Calcutta Film Society, where he first started going in his senior high school along with his uncle, exposed him to the works of directors like Charlie Chaplin, Ingmar Bergman, Akira Kurosawa, Vittorio De Sica, Roberto Rossellini and Michelangelo Antonioni. This, in turn, inspired him take film making as a mode of expression. He started his film career with a 10-minute documentary in 1968, The Continent of Love; eventually he made his first full-length feature film, Dooratwa (Distance) in 1978. His lyricism has been extended to cinema as well. During the early stages of his film career, Dasgupta made films inspired by Satyajit Ray's realistic films and later moved on to other forms. Some of his most acclaimed films are Bagh Bahadur, Tahader Katha, Charachar and Uttara.